The fast-food chain is mostly known in other parts of the country for it's drive-through service, but the new location at 38-06 Junction Blvd. won't have it because of real estate restrictions, said Rex Valencia, who owns the restaurant with his family. Instead the store will be dishing out its signature burgers, wings and soft-serve ice cream from a modest storefront near the Junction Boulevard 7 train station, Valencia said. The store is currently only open until 11 p.m., but the owner plans to expand hours to 3 a.m. when the weather gets warmer, he said. "We're a late-night business, and that area is 24-hours a day alive," he said. The Valencia family also owns four other Checkers restaurants in the city, including two in Queens, and 18 Dunkin Donuts in the city and in Florida, Valencia said. Rod Valencia came to New York from the Phillipines in 2005 and began working in a Dunkin Donuts before he saved up enough money to open his own store about 32 years ago, according to his son, Rex. "He learned how to do it, saved his money and opened his own," Rex Valencia said. 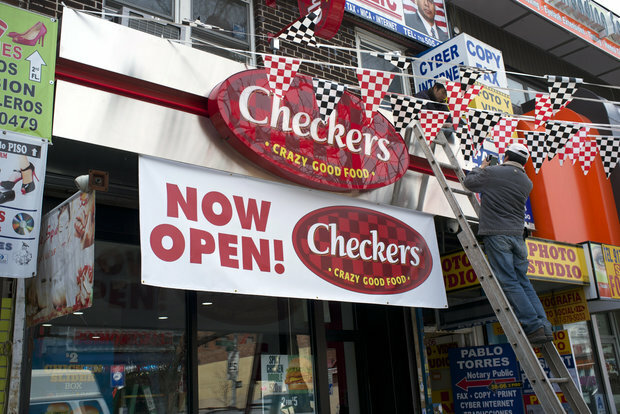 Business so far had been good, and Checkers' economical menu is well-received by neighbors, Valencia said.